Cruising provides a friendly, comfortable travelling option for solo travellers. Single people are welcomed into joining all activities on board, and their specific personal needs and requirements are met with ease. Cruising, therefore, not only offers a relaxing vacation but also the opportunity to broaden social skills and experiences. As a solo traveller on board a cruise ship you will receive the kind of pampering services normally available in hotels, along with the freedom to enjoy the amenities and activities you would find at a large resort. There are also many opportunities to increase your circle of friends as cruise travellers are always encouraged to socialise and meet new people who may share the same interests. Dining and dancing provide the perfect opportunity to socialise, and whether enjoying organised activities on board or during land trips or relaxing by the pool, the solo traveller will feel included and pampered. Cruising is no longer considered as a travel option for the wealthy. 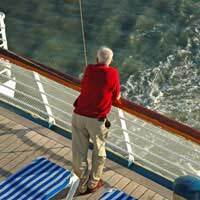 Families, senior citizens and solo travellers – young and old – are able to enjoy the tranquility of the sea and the wide range of activities on offer aboard prestigious cruise ships or smaller, more intimate vessels. The number of young solo travellers, who are exploring cruising as a travel option, has increased considerably and many cruise liners now offer specific travel packages that appeal to their sense of adventure. Travelling solo in any way, and to any destination means that as an individual you have to take full responsibility for your travel arrangements, possessions and how to fill in the time you spend on your own. Cruising takes a lot of the effort out of having to find activities to entertain and provide a stimulating travel experience for a solo traveller. Whether you choose to mingle with other singles, talk to other guests or generally keep yourself to yourself, a cruising solo traveller has many choices and options to consider on board. In order to encourage more solo travellers to experience cruising a number of cruise lines are now offering, or considering, introducing single occupancy studio staterooms, that are furnished with a full-size bed, flat-screen tv and mood lighting. Solo travellers are generally attracted to cruising because of the tranquility that sailing offers. They are also often tempted by the wide range of activities that cruise lines can provide. Besides the type of pampering service, that is found at first-class hotels, cruising hosts singles’ parties and gentlemen host events – that match up solos based on their dancing ability. Single supplement costs are usually applicable to solo travellers on cruises. To avoid having to pay the additional charges, that increase your travel budget, it is worth considering a cabin share. Some specialist cruise operators provide a Find A Travel Partner service, where singles and solo travellers can register their details and search the database of potential roommates to find someone with similar interests or personality. Finding a suitable match means a solo traveller not only incurs no extra supplements but has also found a new travel companion and potential future friend.